Wilson Daily Times, 14 January 1956. In the 1900 census of Wilson, Wilson County: wheelwright Charles Dardin, 44; wife Dianna, 40, sewing; and children Annie, 21, sewing; Comilous, 15, tobacco stemmer; Arthor, 12; Artelia, 10; Russell, 5; and Walter, 4. In the 1910 census of Wilson, Wilson County: blacksmith Charlie Darden, 55; wife Dianah, 48; and children Cermillus, 24, bicycle shop owner; Arthur, 22, teacher; Artelia, 18, teacher; Russel, 16; and Walter, 14. Camillus Louis Darden registered for the World War I draft in Wilson County. Per his registration card, he was born 26 June 1884; resided at 110 Pender Street; was a self-employed undertaker at 615 East Nash Street; and his nearest relative was his father Charles H. Darden. In the 1920 census of Wilson, Wilson County: at 110 Pender Street, blacksmith Charles H. Darden, 65; wife Mary E., 55; sons C.L., 35, and Artha W., 27, undertakers; and [step-] daughter Mary H., 19, and Cora B., 11. Camillus Darden married Norma E. Duncan of Montgomery, Alabama. In the 1930 census of Wilson, Wilson County: at 108 Pender Street, Calamus L. Darden, and wife Morma, 30. Their home was valued at $10,000. In the 1940 census of Wilson, Wilson County: at 108 Pender Street, undertaker C.L. Darden, 45, and wife Norma, 40. C.L. Darden executed his will on 1955. He devised his business, Darden Memorial Funeral Home, to his wife Norma E. Darden, brother Dr. Walter T. Darden and nephew Charles Darden James in one-half, one-quarter and one-quarter shares respectively. The property on which the funeral home was located, 608 and 610 East Nash Street, as well as an adjacent lot known as the Darden Shop lot, were similarly devised. His wife was to receive his residence at 108 Pender Street, and property at 203 Stantonsburg Street was to be sold and the proceeds divided between his sisters Elizabeth Morgan and Artelia Tennessee; his nieces Artelia Tennessee Bryant, Thelma Byers and Artelia Davis; and a long-time employee Frank Davis (with provisions to guarantee each received at least $1000.) All personal property was devised to wife Norma, and equal shares in all other real property to nieces and nephews Charles Darden James, Randall James, Johnnie K. Reynolds, Artelia Davis, Thelma Byers, Bernard Tennessee, Eugene Tennessee, Artelia Tennessee Bryant, Norma Jean Darden, Carol Darden, and Charles Arthur Darden. 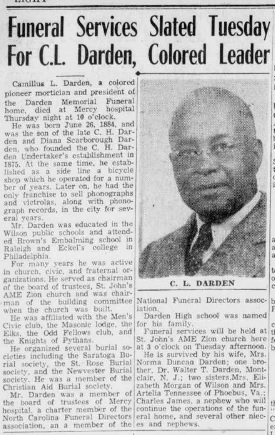 Camillus L. Darden died 12 January 1956 at Mercy Hospital. Per his death certificate, he resided at 108 Pender Street; was born 26 June 1884 in Wilson to Charles Henry Darden and Diana Scarborough; was married to Norma Duncan Darden; and worked as a mortician. Charles D. James was informant. Read more about Camillus Lewis Darden here and here and here and here. The Darden house at 108 North Pender Street. Photograph by Lisa Y. Henderson, May 2017; U.S. Citizen Passenger Lists of Vessels Arriving at Tampa, Florida, Records of the Immigration and Naturalization Service, 1787- 2004, digitized at Florida, Passenger Lists, 1898-1963 [database on-line], http://www.ancestry.com; North Carolina Wills and Estates, 1665-1998 [database on-line], http://www.ancestry.com.